13-Pocket expanding file keeps documents organized. Open top, stand-up design provides easy access. To Receive Free Retail Display: Order 12 each of item 48212. 13-Pocket expanding file keeps documents organized. Open top, stand-up design provides easy access. 13 pockets with gusset expand to hold important letters and documents. 12 dividers with pre-printed tab inserts. Colored polypropylene. Expands to 9 inches wide. Holds 900+, 8-1/2 x 11 sized sheets. Plaid. Hi, I'm Jen at C-Line, and today we're going to talk about our 13-Pocket Stand-Up Expanding File in the Plaid Fashion Design. 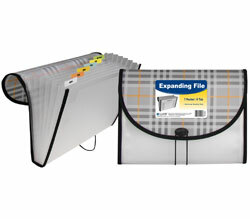 The expanding file keeps your office organized and your files easily accessible. It sits right on your desk, and it's convenient for accessing frequently used files and information. The 13-Pocket Expanding File comes with preprinted tab inserts that are printed on the front and blank on the back, allowing for easy customization of your file tabs. Additionally, it expands up to 9 inches wide and holds up to 900 sheets of paper. The Plaid Fashion Design lets you organize your files in style whether at home, at school, or at your place of business. Order yours now. That's all we have for today. I'm Jen at C-Line and thanks for watching.